Well, I am finally in Singapore and have begun student teaching! The first five weeks of the semester I spent on Hope’s campus, taking the “6-hour-block,” which is a block of three education classes which all special education majors are required to take during fall student teaching. Although I loved being able to spend time with friends and experience beautiful Holland at the end of summer, I was very anxious to be able to leave for Singapore! Last Wednesday, I had my final exam and after saying goodbye to my Hope family, I drove back home to Chicago for a flight on Thursday. On our way to the airport on Thursday, I was notified my flight was delayed…meaning I wasn’t able to fly to Singapore until Friday. The 4+ hour flight to San Francisco went quickly, but the 16+ hour flight from there to Singapore seemed to drag on and on. I arrived on Sunday morning, and attended church just a couple hours after I arrived with my aunt, uncle, and cousins. I began student teaching bright and early on Monday morning, and really just jumped right in. We had three days of classes, followed by two days of parent teacher conferences. Although it was an overwhelming week, it was exciting as I learned more about what I will be experiencing the rest of the semester. I am loving my student teaching placement and am looking forward to exploring more of Singapore and surrounding countries. My focus this week was on adjusting to student teaching, but I have had a chance for a couple other experiences! 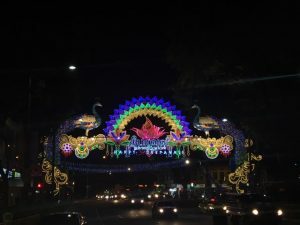 The highlight of the week was going to Little India, an ethnic district in Singapore. There, I tried my first real Indian food, and thoroughly enjoyed every bite. 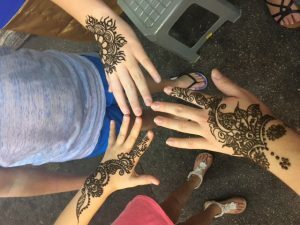 I also got my first henna! 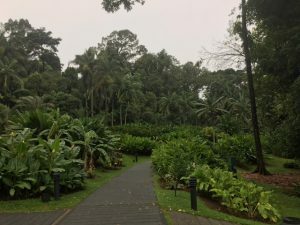 Singapore Botanical Gardens, which was just beautiful. I may not mind running so much with scenery like that!